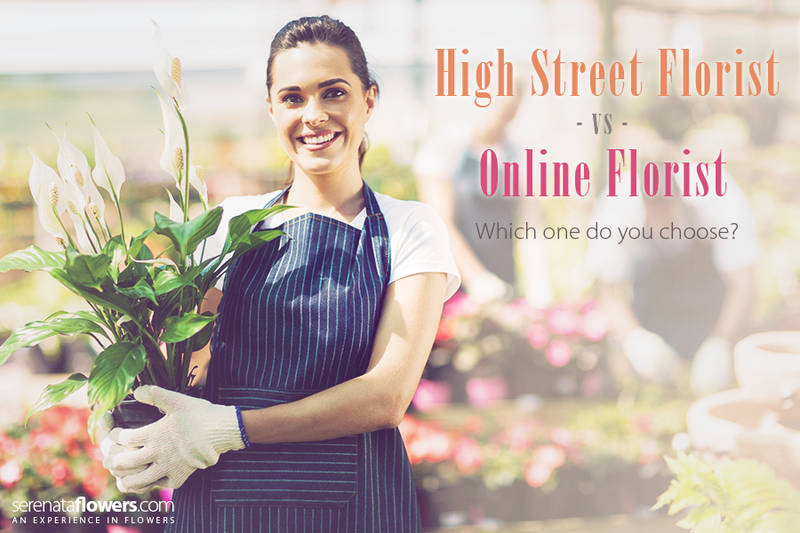 Online Florist vs High Street Florist – Which one is Better? With 2015 seeing an even larger number of individuals turning to their tablets and smartphones in search of the perfect bouquet of flowers it poses the question; is online florist any better than a high street one? No one can deny the fact that popping into your local florist is a great experience; the stunning smell and the sight of those lovely flowers, really is something to behold. An image of a flower is great but how do you know that’s what it will actually look like when it turns up? Buying online means you have to put a certain amount of trust in the seller. Buying from a florist gives you the chance to see (and smell) before you buy so you know exactly what you’re getting. We all love a personalized service, where the florist will ask you what the occasion is and what the individual is like. This allows them to create a tailor-made or bespoke bouquet that really suits your recipient down to the ground and is a key benefit of visiting a local store. In some cases, but not all, you may be charged an order fee when ordering your flowers online. This is not the case when you get them from a florist and you simply get what you pay for. You may have to pay delivery fees if you don’t want to collect your flowers yourself though so it’s important to weigh up all the costs before making your decision. Online florists boast practicality and ease and that is why we all absolutely love to simply click a few buttons and – hey presto – a fabulous bunch of flowers is set to arrive on our doorstep! Unlike high street florists, you know what you are paying for when ordering your bunch of flowers online. Each bunch will have a particular price with it, meaning that there are unlikely to be any fluctuations in price or hidden costs you hadn’t factored into your calculations. Some online florists will also provide discount codes if you have signed up with them and/or have certain deals during events such as Mother’s Day and Valentine’s Day. This means even more chance of getting a bargain and saving a few pennies. With globalization becoming even more prominent in our everyday lives, it has been essential that florists keep up with it. By ordering your bouquet online you can order from anywhere in the world, to anywhere in the world – it’s that great! So, if you’re sat in your London home and desire a bouquet of roses to be delivered to Canada – it is possible! If you are abroad on a business trip and wish to give your partner a treat while you’re away, you can even order your bouquet online without having to worry about the time zone difference. With everything being digital, you only need to ensure you have your credit card at the ready. When ordering flowers, either online or from a high street florist, you have the opportunity to write your very own personal message to your loved one. If you are telling the florist this over the phone then from time to time messages can get misheard and be miswritten as a result. Online florists eliminate this risk by getting you to type your own message so you know that what you type is what will be printed. As well as this greater accuracy, you’ll also find online florists have greater access to a wider range of flowers. There is nothing worse than popping into your local florist only for them to not stock what you want. Even if flowers are out of season in this country you may still be able to order them online from florists with connections all over the world. Whether you are using the best online florist or a cheap florist local to you, all that matters is that you find the bouquet of flowers that are perfect for you … and at the right price! Your choice of using an online or high street florist will largely depend on your needs and lifestyle so make sure you consider what you want carefully and make an informed decision based on this information.